I am grateful for the men and women who have given their lives in the service of our great country. Memorial Day is often misunderstood and some folks think the day is to honor all the men and women who serve in our armed forces. Memorial Day is specifically set aside to honor the “fallen”, and those who have literally given everything in service to the United States. However, I am closely connected to those who have a hearing loss since I “hear again” with the technology of a cochlear implant. I’m also keenly aware and thankful for the men and women who serve our country and as a result … lose their hearing. A man I have come to respect for his fair and straight-forward approach to dissimulating stories and news about hearing loss is Larry Sivertson of Hearing Loss Web. He has an excellent list of recent stories about hearing loss and our military. If you have time, please check out the stories from his website. 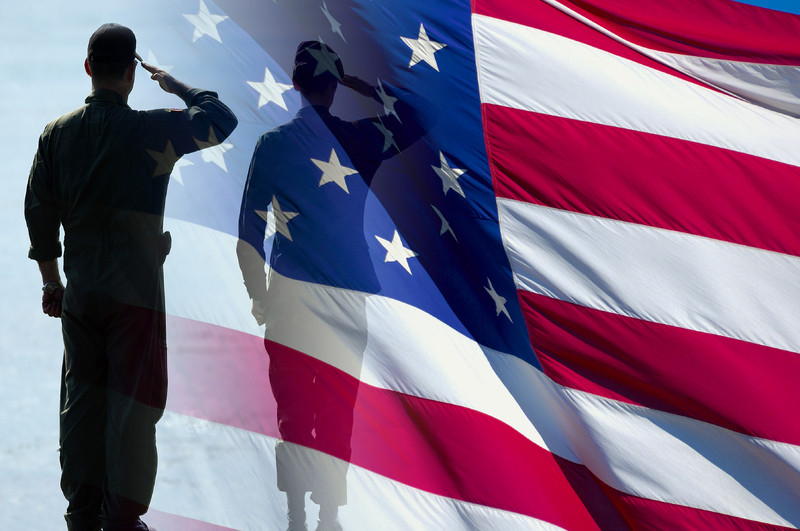 Many men and women come home after serving our country in active military zones with a hearing loss. Thankfully, many are able to be implanted with a cochlear implant. I thank God for those who have given their lives in service to our country. I am grateful for those who have served and as a result lost their hearing or suffered some other acquired disability. There are sacrifices made that we can never understand or fully appreciate. Many come home with invisible disabilities like hearing loss, but others come home internally wounded by what they have seen, heard, and experienced. Today I pray for all the men and women who serve our country and gratefully pray for them. My young adult children enjoy going to the bank with numerous paychecks and depositing their money into both savings and checking accounts. I envy them sometimes, for my husband and I certainly cannot wait to deposit numerous checks. Instead we worry about looming car repair bills, vet expenses and other various “unexpectedness” that ensures every paycheck is automatically credited to our account. 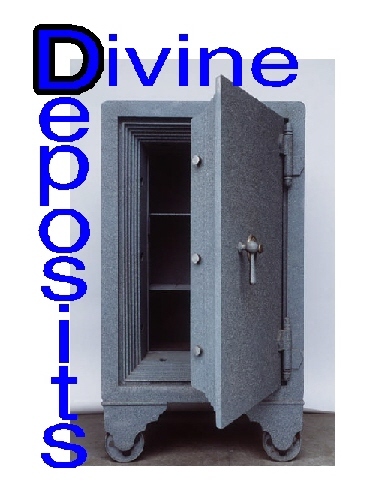 This week I have been thinking about “divine deposits”, perhaps because I’m feeling DIRT POOR but more likely because I’ve experienced what it means to have someone deposit part of themselves into my life. No matter how hard things are in my life, I can always “count my blessings”. I’ve experienced financial crisis, loneliness, loss, fear, disability, heart break and depression; yet, I’ve never been completely bereft of blessings. I’m certainly a believer in considering the “good” and recognizing the power of blessings perceived. However, I believe John Calvin best described the REASON for our blessings. Blessings aren’t actually blessings unless we turn around and do something with them. If we simply receive a blessing and let it “sit in our soul bank”, the value of that deposit plummets. So HOW Do I Bless Others? Oh sure! Some people use anonymous gifts of money to be a blessing to someone else. However, I believe that blessings are rarely monetary. The cash value of blessings may be low, but the eternal value is considered priceless! I recently stood in the hospital room of a dear lady dying of cancer. She could no longer speak because of the difficulty in breathing. Yet even in her pain-wracked body, you could see the yearning in her eyes to “give back” to those visiting her crowded hospital room. 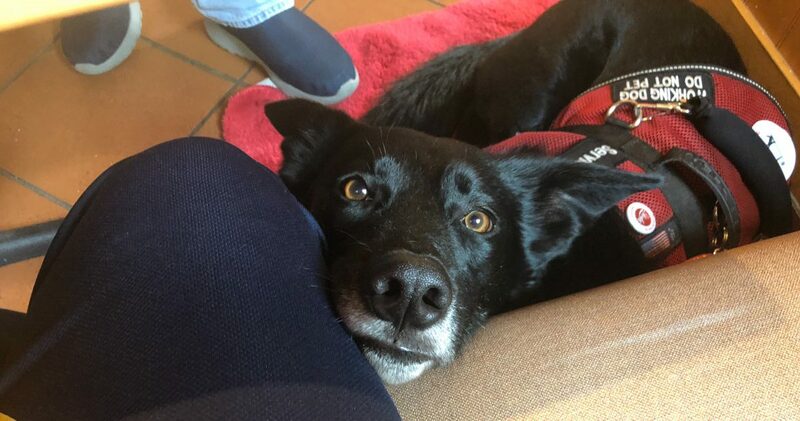 Each person who entered was greeted with a small smile, warm pat on the hand and dazzled by the twinkle in the eyes of this “walking blessing”. I know of people who have adjusted to a life-changing, unexpected hearing loss, who cheerfully participate in the Walk4Hearing so that others can benefit from the local and national support of the Hearing Loss Association. Cochlear implant recipients often become mentors to others who are thinking about being surgically implanted with these bionics, or are new to “hearing again”. An investment is made in the life of someone else… an investment of time, advice, friendship, and understanding. The trainers at Fidos For Freedom are volunteers. Countless hours of dedicated training and expertise are poured into every match of client and canine. The trainers are not paid for their work… at least not on THIS side of Heaven. I believe these compassionate trainers do what they do because someone else invested in them… they are simply “paying it forward”. Sure, the neighbor that benefits from your own “dispensed blessings” may be someone who actually lives nearby. Yet a ‘neighbor’ is often someone you have never met. It is possible to even be a blessing without being consciously AWARE. This is the result of living a life in such a HABIT of kindness, that blessings just ooze from your pores and influence complete strangers! 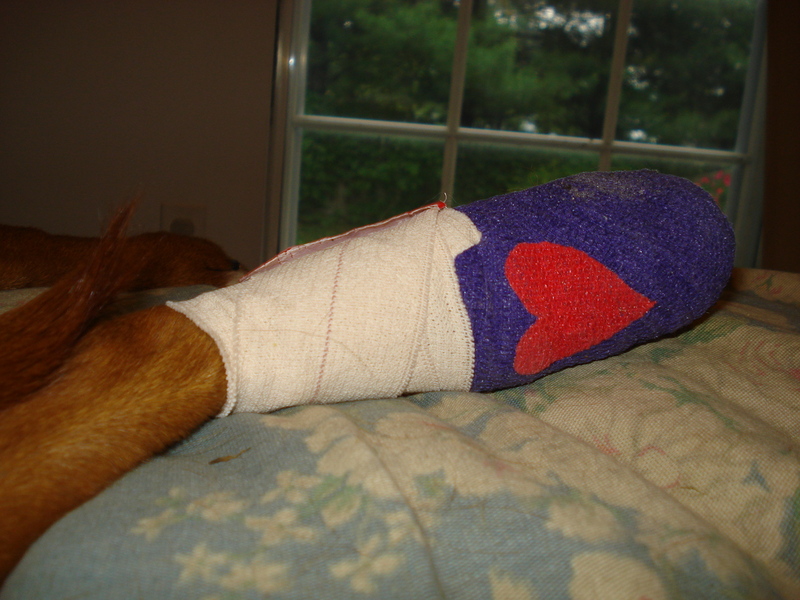 At the park on May 16th, Chloe caught the toenails of her back foot in the holes on the metal stairs. 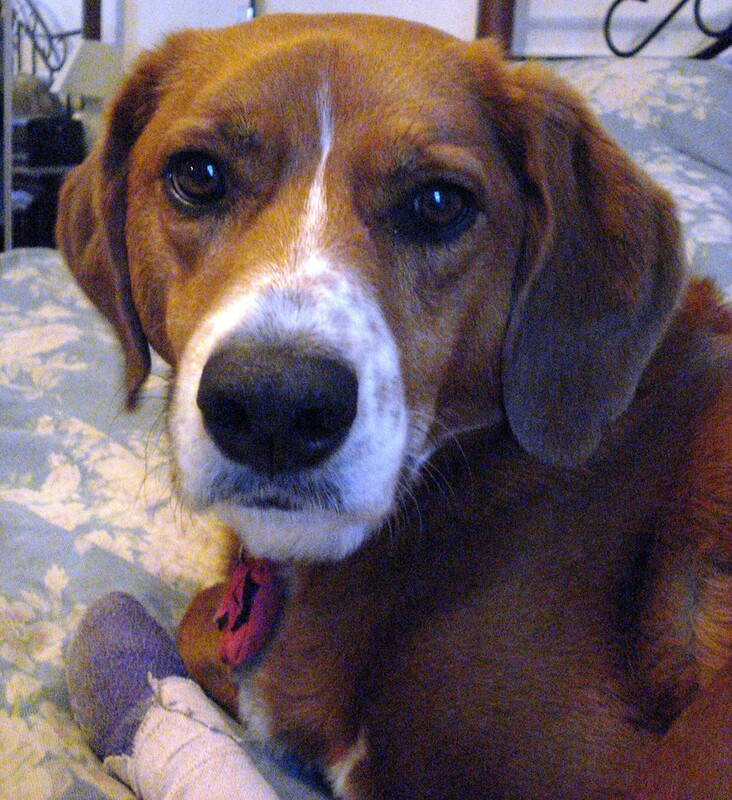 She tore her foot loose in a panic and lost 2 nails immediately, with a 3rd one barely attached. 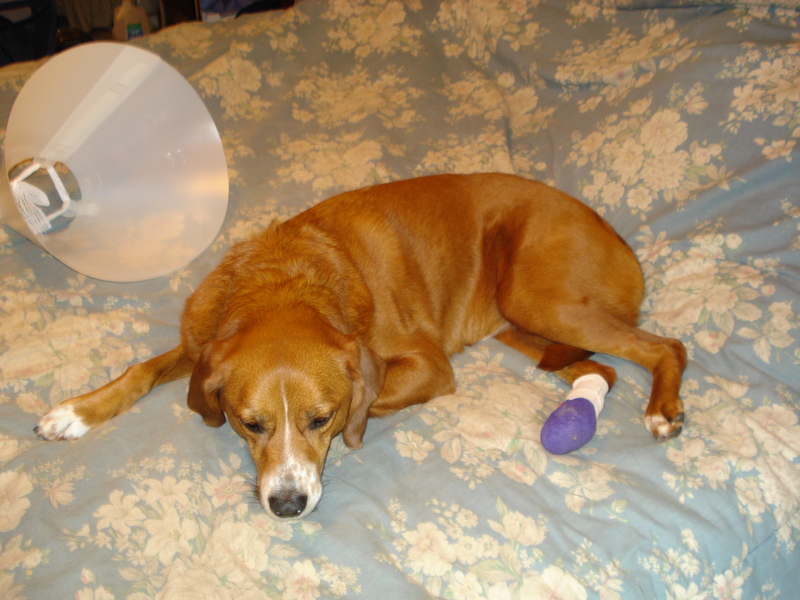 It required an emergency visit to the vet to get the two cauterized, and surgery on Tuesday to remove the 3rd one that wasn’t healing. Everything ended up infected and sore. She is much better now! The “wag” is even back in her tail. She whined while I was folding some laundry, so I finally allowed her to assist. You can see she is a happy camper to be back at work! Thanks for all your well wishes and prayers on her behalf! Do Not Put it Off! This week marked the end of my son’s life as a high school student. In a couple of weeks, my parents will be here to celebrate at his graduation ceremonies for Chieftain Christian Academy. Although Chris did most of his senior year at a local community college (since he goes free thanks to “Dad” working there), he still did a couple of classes at home. I’ve been more “hands off” in his education this year, but still had the opportunity to make sure he was logging hours for that 1/2 credit of Bible he needed. I was still his “teacher” for Geometry, something we put off far too long! I was still busy grading papers, generating paperwork for our co-op, and preparing lesson plans for the kid. Now the “kid” is done, and I find myself asking, “What do I… want to be when I grow up?” My life has pretty much been on hold for twenty years, in spite of working part-time as a teacher throughout. Every school year revolved around the kids, as did every activity, field trip, book purchase, and support group meeting. Now we are “done” with this chapter in our lives and I once feared I would be left feeling deflated. But… I have a plan of action. That is part of the reason I have been going to school part-time. I’ve been taking 6-9 hours a semester of graduate level courses in Psychology. 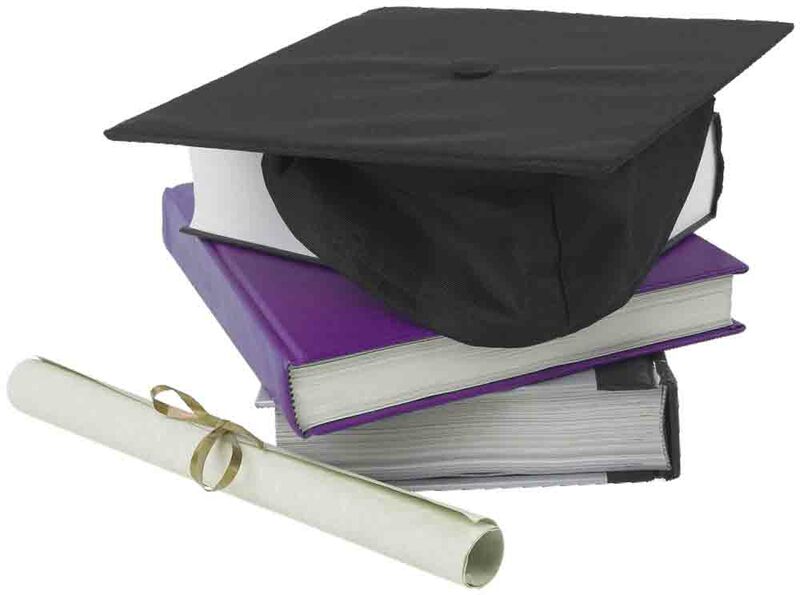 I’m set up to complete a Master’s program at the end of 2010. In spite of all of these years of concentrating on my family, I really didn’t think there would ever be a day I could look to my own dreams. It’s hard to believe that it has been almost twenty years since I first began to notice a dramatic change in my hearing. In the beginning it was so hard! Even my own parents and siblings had difficulty believing I was really losing my hearing. After all, when I was being raised at home, I only had a mild hearing loss in one ear. It didn’t make sense to them that ten years could make that much difference in my hearing. I remember one of my kids coming home from Colorado after visiting family, visibly upset because someone had told them that my hearing loss must be “put on”… that it wasn’t real. They had no idea how to respond to the lack of belief in acquired disabilities. They knew I couldn’t “hear” in the dark (since I speech read). They knew how frustrated I was when my hearing aid battery would die. They knew how terrified I was of the phone and how I was slowly dropping out of activities at church since I couldn’t hear. I remember talking to my little sister on the telephone prior to my cochlear implant surgery. She wanted to know why I would consider surgery and take that risk. I remember staring at the phone incredulous at her question. Here I was reading captions from a Cap-tel phone, in order to even know what she said… and THAT wasn’t 100%. I explained how minimal the risks were to cochlear implant surgery and tried to explain how desperately I WANTED MY LIFE BACK. I didn’t let their reservations stand in my way. Thankfully, my immediate family understood the struggles I faced each and every day and were so supportive! Other late-deafened adults were encouraging and enthusiastic about my surgery. Getting a cochlear implant allowed me to dream again. Because I can hear as well as I do, I look forward to giving back in some way… of doing something outside the home. Don’t get me wrong… I have loved being a keeper of the home and the opportunity to spend so much time with my kids. However, I really thought that at the end of this time I’d be facing an empty nest and feeling unnecessary. Once I could “hear again”, everything changed. I’m at the end of this journey and at the beginning of a new one! I’m feeling rather hopeful, excited and NECESSARY. Do you have a hearing loss? Do hearing aids and other assistive devices no longer help you very much? 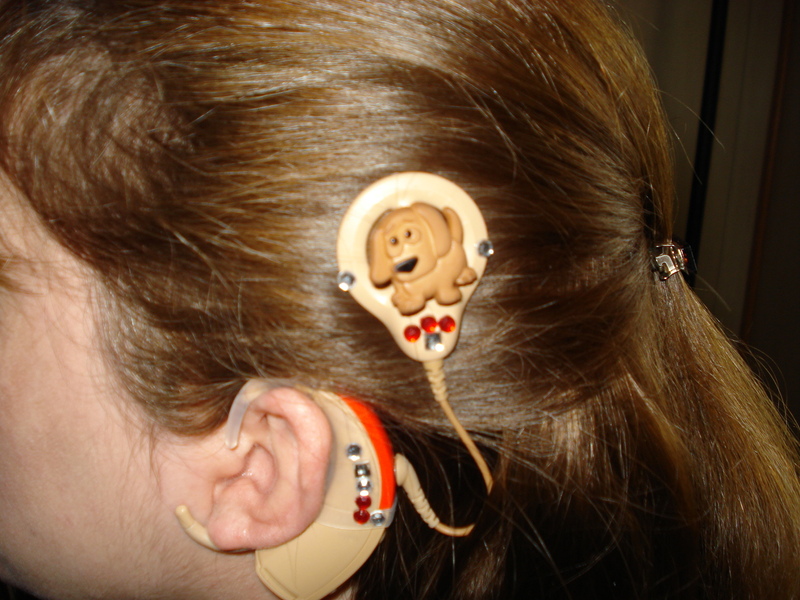 Have you been evaluated and been told that you qualify for a cochlear implant? DO NOT PUT IT OFF. The risks are minimal, the pay-off is HUGE. It has been five years since I was activated (May 13, 2005). I have no regrets other than I waited as long as I did. I qualified for a cochlear implant three years before I finally went through with the surgery! I’m dreaming again. I’m excited about the future. I have plans, goals, and am slowly but surely “getting there”. I can hear with this bionic ear of mine! Hey! I’m still here… I promise! Chloe was hurt in a rather “freak” accident, and we’ve been to and from the vet so much I could drive there blindfolded. I’ll catch everyone up on Monday. I have a lot on my mind and want to share… Just MUCH TO DO between now and then. Today I went to Johns Hopkins for my 5 year mapping. It always feels surreal when I go, for five years is simply not enough time to pass that I have already forgotten what it felt like not to hear. As I go in the parking garage, I can clearly hear the ticket machine ask me to take my ticket with me so that I can pay before exiting. When I approach the hospital, I can hear the revolving door “clicking” as it slowly rotates inward. I clearly hear the “ding” of the elevator as I wait for one to come to the first floor. None of these things were discernible to me 5 years ago. I guess you could say my ears became “reborn” on May 13, 2005. 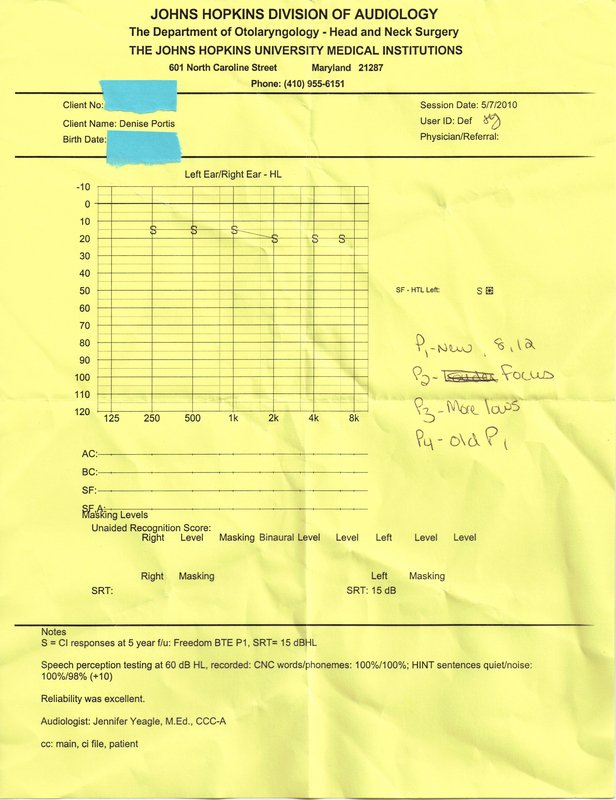 Below is my audiogram 5 months before my surgery. 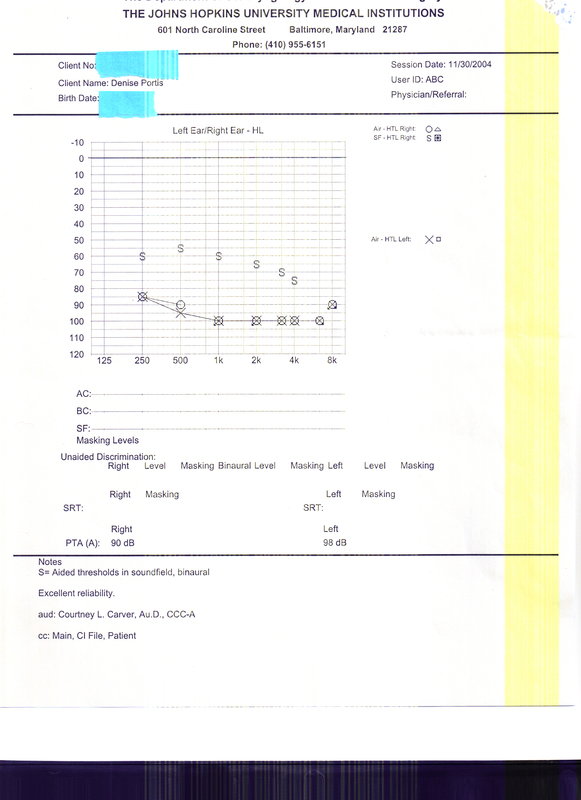 It shows I had a 90 dB loss in my right ear and a 98 dB loss in my left. My left ear is the one I decided to implant. Below is the audiogram from today. My audiologist is one of my favorite people. She’s very easy to talk too, and VERY good at what she does. She created a new program in my “P3” slot that I’m going to work with to see if I can hear my son’s voice any better with in comparison to my normal program. In the sound booth… I actually tested “best” with the lower tones, so it could be that I’m going to have to start fussing at my son to project a little better with that deep voice of his! (Look up when you talk… don’t have your face buried in your laptop). She doesn’t test my right ear anymore, but you’ll note that my left ear (once a 98 dB loss) is now testing at 15dB loss. Better yet, check out the bottom where it has my words/Phonemes and HINT sentences testing in quiet/noise! My audi is never “pushy” but she reminded me that should I ever wish to consult with Dr. Niparko about getting a 2nd CI, that I can just call and make an appointment. Right now with my balance issues, I just do not feel the need to pursue that as I’m “hearing” so well. Maybe… SOME DAY. Check out my May “bling”. Remind you of anyone?